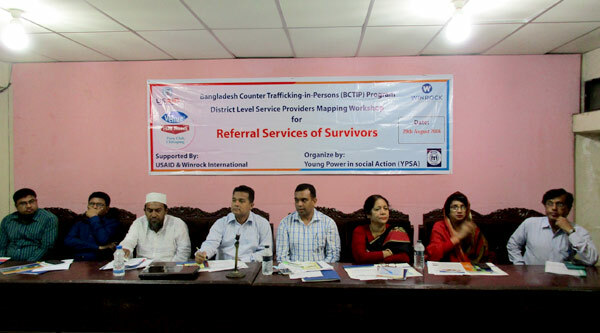 YPSA organized a District Level Service Providers Mapping Workshop on Referral Services for the Survivors under YPSA-BCTIP Program (Bangladesh Counter Trafficking-in-Persons) supported by USAID and WINROCK International. The workshop was held at the Chittagong Press Club on 29 August’16. This event was presided over by Professor Dr Amir Mohammed Nasrullah (Chittagong University). Md. Habibur Rahman (ADC-Education & ICT), Chittagong was present as a chief guest and Md. Sayeed Hossain (Deputy Director of District Information Office), Borhan Uddin Md. Abu Ahasn (Deputy Director of Islamic Foundation), Md. Jahirul Alam Majumder (Assistant Director of DEMO), Alamgir Hossain (Assistant Director of Social Welfare and Deputy Super of Safe home-Forhadabad), Jesmin Parvin Jeshi (Counselors of CCC) and Khaleda Begum (Team Leader of YPSA) were present as special guests. Representative from service provider institutes (GOs and NGOs), civil society, print and electronic media and different NGOs also participated in this program. The objectives of this workshop were to find out the appropriate services options for survivors of trafficking to ensure protection and promotion of the human rights of trafficked persons in all circumstances; a cooperative framework establish to ensure survivors and at risk group to receive the best possible services; develop a district level directory which would provide a formal system of victim support and easy access to rights (from access to justice to the reintegration process). At the beginning Ms. Khaleda Begum, Team Leader of YPSA has given welcome speech at the program and shared the objectives of the workshop. She said, in Bangladesh, human trafficking is one of the major problems these days and lot of people died in the sea for on the way to Malaysia and Thailand. At present Govt and civil society are engaged for capacity building for stakeholders against human trafficking. In his speech ADC (Education and ICT) mention that, YPSA is performing greatly in this locality for the betterment of trafficking survivor under the BCTIP program. These are a kind of initiatives which focuses on the rights of trafficking survivors we are responsible to ensure the rights of the trafficking victim. From administration we are promising our full support in such initiatives from YPSA and others service providers. Mr. Syed Assraf Ullah (Program Manager of YPSA-BCTIP) introduces YPSA to the audience and he also presents the power point presentation on YPSA-BCTIP Program including human trafficking related issues, why referral, why it is important for victims’ rights and protection, how those organizations can play a vital role for victim’s protection, identification of survivors right & protection (Through A Case Management Process) and networking & partnership for referral services (Service offering mechanism, how it can work, what are the challenges, best way of coordination) etc.